Mark Webber cruised to his third Formula One victory of the season Sunday after overtaking Red Bull teammate Sebastian Vettel on the opening lap of the British Grand Prix. The Australian finished 1.36 seconds ahead of championship leader Lewis Hamilton of McLaren, turning in an immaculate drive at Silverstone after being angered by having to hand over a key car part to Vettel. “Not bad for a No. 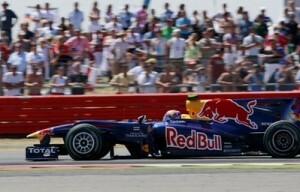 2 driver,” Webber quipped over his radio during his victory lap. Nico Rosberg of Mercedes was third. With nine races to go, Hamilton leads the overall standings with 145 points, 12 ahead of McLaren teammate Jenson Button. Webber is third with 128 after becoming the first driver this season to win three races. Vettel is fourth with 121. Webber’s car has been equipped with the old version of Red Bull’s front wing since qualifying Saturday after the new design was stripped and handed to Vettel, who subsequently took the pole. But Webber led throughout Sunday after pushing Vettel wide on the opening lap, when Vettel also punctured a tire. So they raced 80 laps without a lead change. This is almost standard operating procedure for Formula One races. I watched the Monaco Grand Prix two months ago, and the driver who got the lead on the first lap led all the way. So why does anyone watch these races? For the crashes or to party? I watch most F1 races, where on-track passes for the lead are indeed somewhat rare, but very exciting when they happen. It is a different cup of tea compared to NASCAR or the IRL, where passes mean nothing because they happen several times per lap. Personally, I would enjoy something in between these two extremes. Yeah, people also watch for crashes, the parties, the technology, and some of the off-track drama.